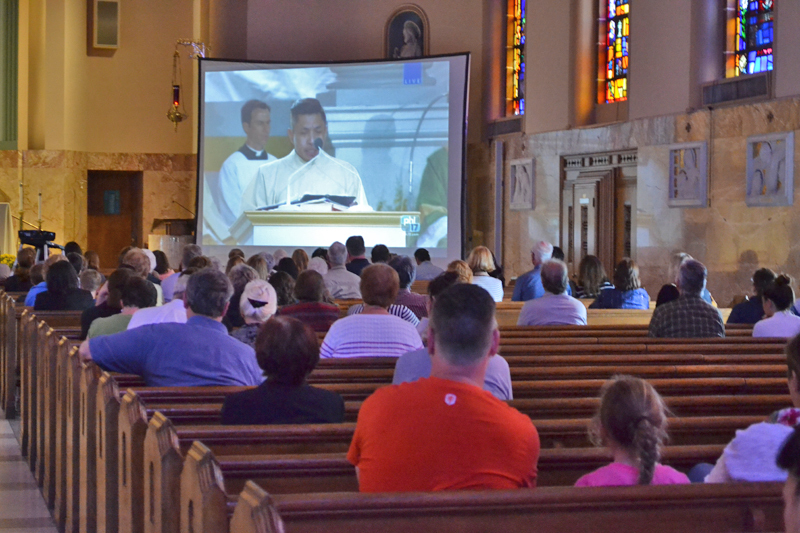 While hundreds of thousands of people attended the Mass celebrated by Pope Francis last Sunday on the Benjamin Franklin Parkway in Philadelphia, many other Catholics across the archdiocese stayed close to home to view the Mass on a widescreen TV in their parish church. At St. Denis Parish in Havertown, approximately 100 people gathered in the church to watch the Mass. Parishioner Stephanie Norton was at the church with her daughter Anna, 8, and Audrey, 5. 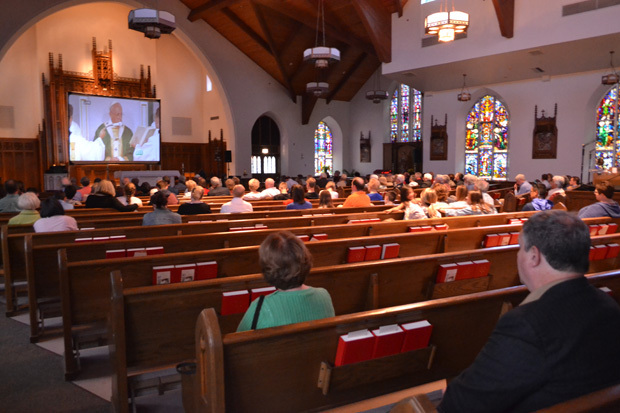 At St. Monica Parish in Berwyn, approximately 100 people came to the church to watch the papal Mass and gather for dinner afterward. Stephanie Walsh Beilman, a member of St. Monica’s, is hopeful the pope’s visit will have a positive impact on the archdiocese. Nicole Baker, who plays the organ at St. Monica’s, participated in the World Meeting of Families Congress at the Pennsylvania Convention Center last week. Lynne Williams, also a St. Monica parishioner, confessed she was content watching the papal events at home. 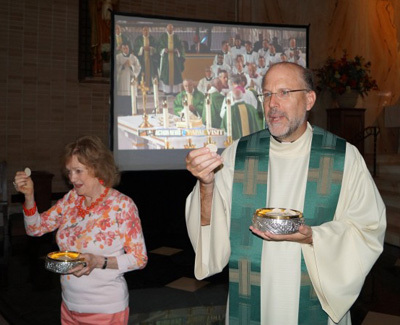 Other archdiocesan parishes hosting viewing parties on Sunday were St. Catherine of Siena, Horsham; St. Aloysius, Pottstown; Holy Cross, Springfield; St. John Chrysostom, Wallingford; St. Mary Magdalen, Media; St. Bede, Holland; Mother of Divine Providence, King of Prussia; Our Lady of Consolation, Philadelphia; St. Raymond of Penafort, Philadelphia; and Our Lady of Guadalupe, Buckingham; as well as Holy Family University.